efficiently. Does all the heavy lifting allowing sales teams to do much more. Kreato text analyze email & call engagements received from customers. Then it identifies the categories that defines the sentiment (positive or negative) and intent (e.g., a query, a meeting schedule or a callback request) of the engagement. The system is trained continuously to learn & a prediction model is built based on these categories. 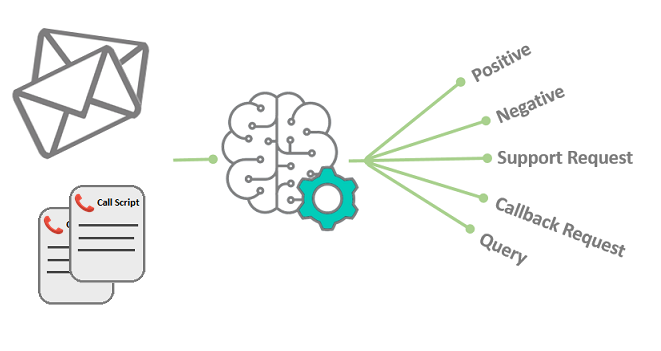 Every customer engagement is then sentiment/intent analyzed with the help of this prediction model and presented to the sales team. 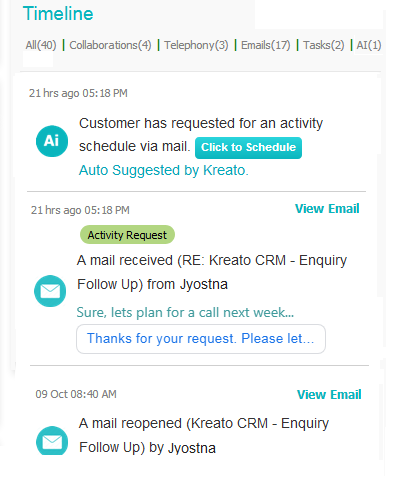 Kreato with the help of timeline of past email engagements (email open/click) of customer, predicts the best probable time to respond customer via email, thus improving the chances of immediate customer attention. 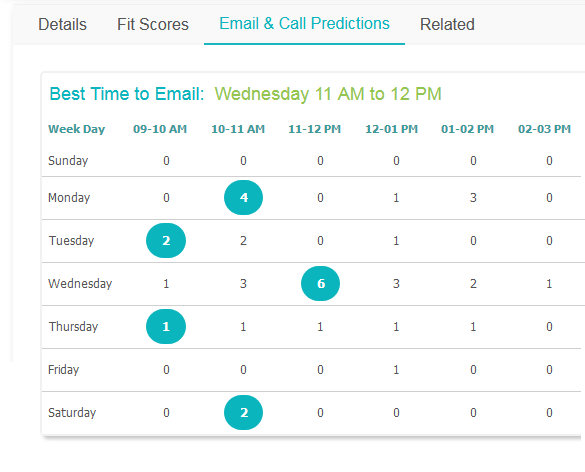 Similarly Kreato analyzes the metadata of past call conversations and predict the best probable time to callback customer, thus leading to more successful sales conversations. Leveraging the intent analysis, Kreato offers relevant contextual phrases for the incoming email that need responses. For example, if the customer has requested for a demo schedule but missed to specify any time schedule, then an auto draft will appear with phrase requesting the customer to confirm his preferred timeslot. At some instances, even though sales reps recognizes the activity requested by customer on the email received, they tend to forget setting reminders whenever necessary. No worries. Kreato alerts sales reps on any such instances, so that he will never miss out on it. Not every time your sales rep recognizes the additional contact details noticed on the sales emails and mark it down for additional references. No worries. Kreato automates this job and alerts sales reps on any such instances.